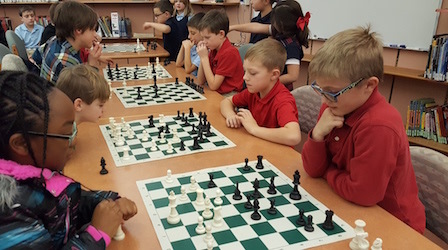 It was a meeting of the chess-focused minds on December 13th as 3rd and 4th graders from TPS hosted their guests from Racine Montessori for the first of two bi-annual matches. Chess-Ed, an after-school highlight amongst students since 2005, is instructed by Ms. Alice Holt and Mr. Matt Oscarson. While the 3rd and 4th graders participated in the meet, students in grades one and two observed a portion of the event following their regular chess class. Considered the sport of the mind, chess helps students learn skills that serve them well throughout their school careers and life.